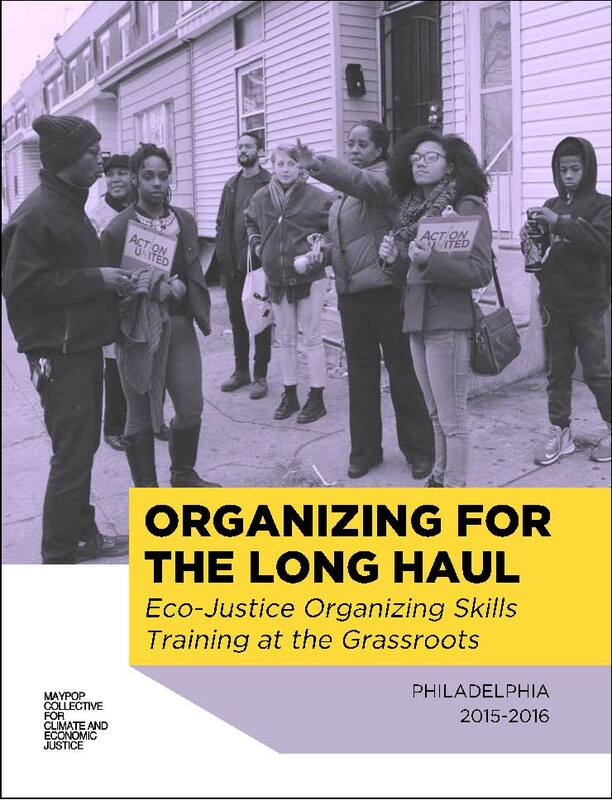 In 2015-16, the Maypop Collective coordinated an organizing skills training with environmental justice leaders in Philadelphia called Organizing for the Long Haul. Click here to read our training report. The project was funded and supported by Rising Tide North America as part of a series of similar trainings across the country. The Philadelphia training brought together eleven leaders from five local environmental justice organizations and campaigns working on diverse issues such as flooding prevention, community-controlled development, landfill remediation, waste incinerator expansion, oil refinery development and pollution, and food justice. It aimed to strengthen and connect local forces for eco-justice among frontline and people of color-led groups. Participants built new relationships across issue and geography, deepened shared understanding of root causes of ecological crises and eco-justice movement strategies, and trained on key organizing skills: nonviolent direct action campaigning, base-building, and fundraising. The training design included a four-day skills-intensive facilitated by guest trainers followed by four “field days” in subsequent months, where organizations hosted participants to apply skills through direct support in their different contexts.